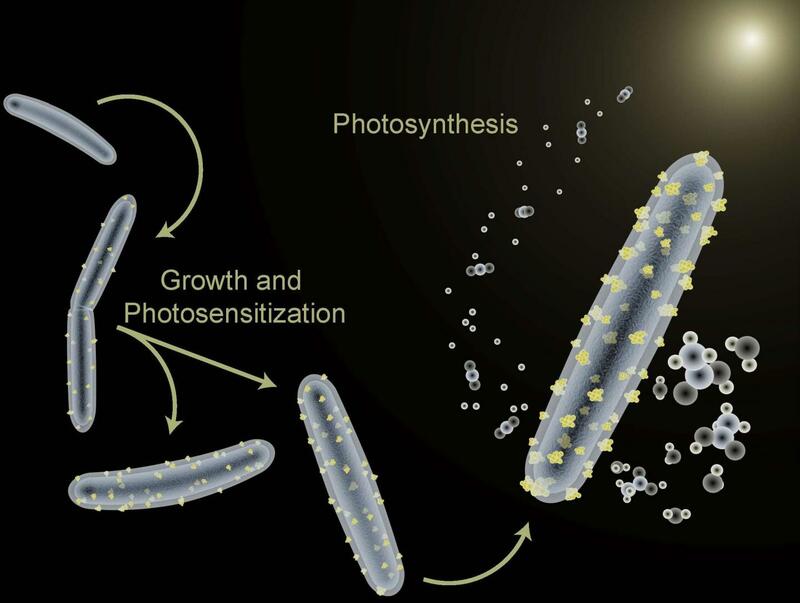 IMAGE: The bacterium Moorella thermoacetica is being used to perform photosynthesis and also to synthesize semiconductor nanoparticles in a hybrid artificial photosynthesis system for converting sunlight into valuable chemical products…. Trainers of dogs, horses, and other animal performers take note: a bacterium named Moorella thermoacetica has been induced to perform only a single trick, but it’s a doozy. Berkeley Lab researchers are using M. thermoacetica to perform photosynthesis – despite being non-photosynthetic – and also to synthesize semiconductor nanoparticles in a hybrid artificial photosynthesis system for converting sunlight into valuable chemical products. “We’ve demonstrated the first self-photosensitization of a non-photosynthetic bacterium, M. thermoacetica, with cadmium sulfide nanoparticles to produce acetic acid from carbon dioxide at efficiencies and yield that are comparable to or may even exceed the capabilities of natural photosynthesis,” says Peidong Yang, a chemist with Berkeley Lab’s Materials Sciences Division, who led this work. Yang, who also holds appointments with UC Berkeley and the Kavli Energy NanoScience Institute (Kavli-ENSI) at Berkeley, is the corresponding author of a paper describing this research in Science. The paper is titled “Self-photosensitization of non-photosynthetic bacteria for solar-to-chemical production.” Co-authors are Kelsey Sakimoto and Andrew Barnabas Wong. Photosynthesis is the process by which nature harvests sunlight and uses the solar energy to synthesize carbohydrates from carbon dioxide and water. Artificial versions of photosynthesis are being explored for the clean, green and sustainable production of chemical products now made from petroleum, primarily fuels and plastics. Yang and his research group have been at the forefront of developing artificial photosynthetic technologies that can realize the full potential of solar-to-chemical synthesis. Cadmium sulfide is a well-studied semiconductor with a band structure and that is well-suited for photosynthesis. As both an “electrograph” (meaning it can undergo direct electron transfers from an electrode), and an “acetogen” (meaning it can direct nearly 90-percent of its photosynthetic products towards acetic acid), M. thermoacetica serves as the ideal model organism for demonstrating the capabilities of this hybrid artificial photosynthesis system. This work was funded by the U.S. Department of Energy (DOE)’s Office of Science. The interface design part of the study was carried out the Molecular Foundry, a DOE Office Science User Facility hosted by Berkeley Lab.